From street level the majestic San Juan Mountains tower above Ouray, Colorado, in nearly every direction you look. It is no wonder the small town has taken to calling itself the “Switzerland of America.” We’ve yet to visit that European country, so we can’t comment on the similarities. 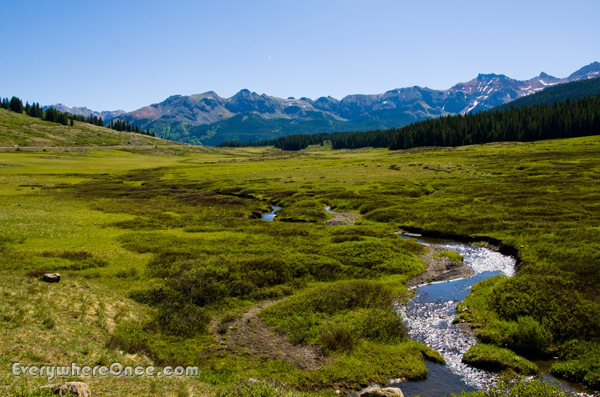 What we can attest to, though, is the awesome natural beauty found everywhere in this corner of Southwestern Colorado. We arrived in Ouray via the San Juan Skyway; a 233 mile scenic loop connecting several historic towns, including our last stop, Durango. Not wanting to drive the motor home over the mountain passes of the Million Dollar Highway, we took the Skyway’s longer western route, and are glad we did. Mile after mile we drove through lush farmland and rolling green mountains toward giant snowcapped peaks. The greenery reminded us of the best pastoral scenery of rural Vermont, only surrounded by dramatic mountains. It all really was a bit too much. 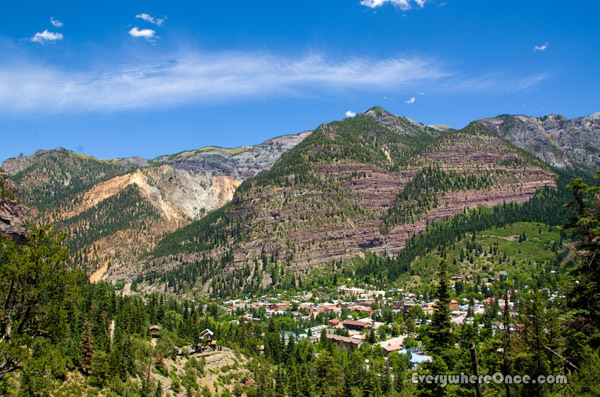 The city of Ouray is no less stunning. Originally established as a mining town, much of its architecture dates back to the late nineteenth century. All of Main Street is registered as a National Historic District, with several buildings individually recognized as National Historic Places. 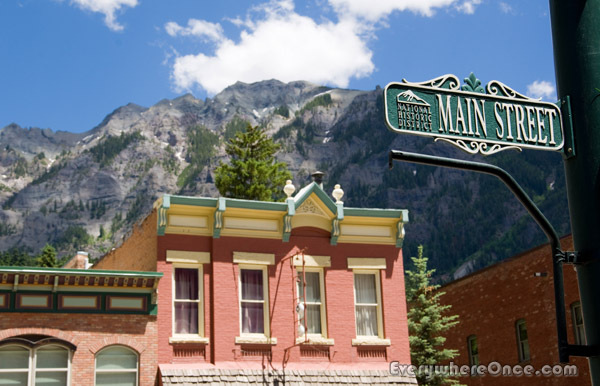 With the mines now shuttered, Ouray thrives today as a tourist destination. The city’s surrounding natural beauty and easy access to abundant outdoor activities draw visitors the world over. 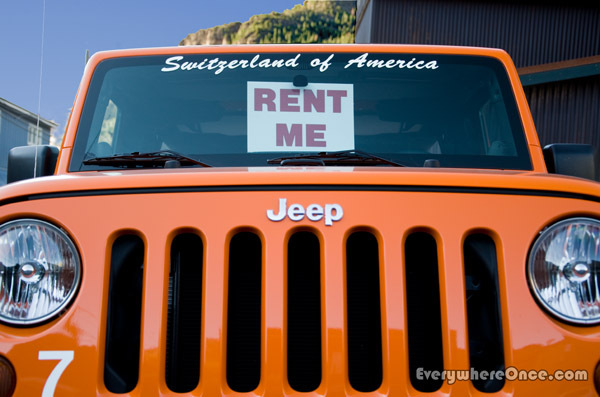 This “Switzerland of America” is also often considered the “Jeeping Capital of the World” by four-wheel-drive enthusiasts. It’s no wonder as the area’s rugged mountain trails lead to ghost towns, abandoned mines, wildflower dappled meadows, and of course, spectacular mountain vistas. But not all, or even most, of Ouray’s activities are motorized. Visitors can access the fabulous “Perimeter Hiking Trail” from many points in town. Ascending the foot of the mountains, the trail encircles Ouray taking trekkers past Cascade Falls and over a bridge spanning Box Canyon Falls. Winter months draw climbers to Ouray’s world renowned Ice Park. The completely free park boasts three miles of vertical terrain in more than 200 ice and mixed climbs; all within walking distance of town. The surrounding mountains also offer numerous opportunities for back country skiing and snowmobiling. After a cold day on the ice and snow, visitors can warm themselves with a dip in Ouray’s hot spring. Open year round, the million gallon public pool has soaking sections naturally heated to various temperatures ranging from 86 to 106 degrees. More than warm enough to break the winter chill or to sooth muscles soar from exploiting Ouray’s outdoor activities any time of year. Yeah, I imagine little towns like this are all over the mountains. Yes, I to Love that area. Spent some time there in my RV in 1995 . Beautiful !!! I did drive the rv on the million dollar highway but the winnie was only 20 ft. so doable. Loved Silverton !! Yeah, the MDH is definitely doable in an RV. Good roads and the grades aren’t terrible. We have driven the Million Dollar highway, and couldn’t imagine that you had driven the motorhome on it! Thanks for reassuring me. Glad you found the San Juan Skyway. We hit Ouray in late May about 8 years ago and the mountains were still snow covered…what a beautiful location. So many of these places I’d like to get back to in winter, or in fall. The Ice Park must be amazing! This is definitely up there in my top ten places… you’re tempting me to revisit one of these days – if I ever decide to venture that far from the coast. What a fantastic looking place. I would say it could well be the Switzerland of America. It reminds me a lot of Chamonix Mont-Blanc (which I visited over Easter.) There you have snowy mountain vistas around every corner of the town and on the journey to it as well. Ok this town is in France but it is very very close to Switzerland and ithe mountains that surround it are also the Alps so I maybe I should say Ouray could be the Chamonix Mont-Blanc of America! “The Chamonix Mont-Blanc of America.” I love it! Looks like a fantastic place to visit. I have yet to spend much time in Colorado but it is on my list. I love the box canyon of Ouray, feels like you’re completely enclosed by rock. It was neat because the sun didn’t really come up until maybe 11:00 and then was gone early. Most of the morning and evening the town is cast in shadow.